Need to get up and running ASAP? UPtime Express™ features select New London Engineering products that ship quickly! More than 29,000 sizes are available to ship in 24 hours. Just place your UPtime Express™ product order by 2:00 p.m. Central Time. We’ll specify a reliable carrier and guarantee shipment on the date promised … or we pay the freight. We’re regularly adding new products to the UPtime Express™ program. Call (800) 437-1994 or contact your sales rep for an up-to-date listing. 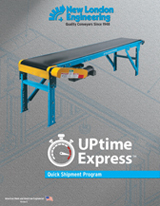 Download the UPtime Express catalog to view all conveyors available in our Quick Shipment Program.